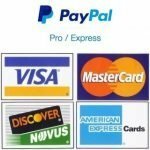 A sauce mop sometimes referred to as sop mop, is named so because the old fashion style mop heads are made just like an old cotton strand mop for the floor. Fortunately recently there have been some modern advances to apply your barbecue sauce. 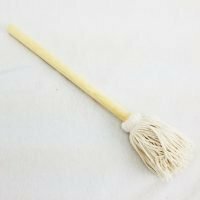 Even some of the old fashion cotton mop heads are now made to be removable so that they can be more easily cleaned or changed. The real advances come in the form of the silicone sauce mops. 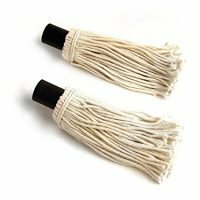 Mop heads with silicone bristles are very easy to clean and are more functional for thick sauce then their cotton counterparts. While most of these still use a wooded handle: Just unscrew the mop head rinse and toss in the dishwasher to clean. Cotton head will eventually begin to shed where silicone won’t. 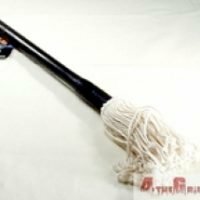 To enable the silicone mop heads to hold more sauce and for longer most of the manufactures have either added some holes to their strands or little balls. 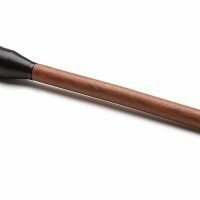 Silicone is so slippery a round strand would just allow all of the barbecue sauce to run off of the mop. 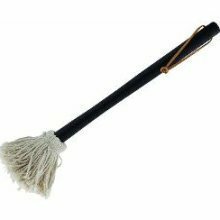 Even though I think I fall into the old way is better thinking most of the time even I cringe at the thought of a cotton mop head. Especially at a rib burn off. Yes they can be thrown into a dishwasher or washing machine but I have a hard time believing that it is fully clean.